ARCore, the Augmented Reality SDK that allows for Android phones to create AR experiences, looks set to be one of the many things that Google is going to be releasing at Mobile World Congress next week. According to an exclusive report in Variety, the Mountain View company will release the first version of ARCore to the public and it will work on Android Nougat and Oreo devices. Google is set to make a major push to bring augmented reality technology (AR) to Android at Mobile World Congress in Barcelona next week, Variety has learned from sources familiar with the company’s plans. Central to these efforts will be the release of the company’s ARCore framework, which will allow third-party developers to bring AR apps to Android phones. This is a significant step forward for the company’s AR plans as, to this point, ARCore has only been available on Google Pixel devices in a pre-release state. Google has set lofty goals for ARCore as they want to have it on 100 million devices by the end of March. That’s this March, like, next month. Since the SDK is expanding out to devices running Nougat and not exclusively Oreo or Pixel phones, it is perfectly reasonable that they will indeed hit that number. For those who haven’t kept up on Google’s Augmented Reality plans, ARCore is the replacement for the company’s first AR attempt, Project Tango. That required specialized hardware and phones. ARCore is a software solution that allows a device’s camera to be used to put AR objects in a photo. Right now, on Pixel devices, this is done through the camera app and the AR Stickers area. There you can put characters from Star Wars in your photos, or those from Stranger Things. Clearly this is just the tip of the iceberg. 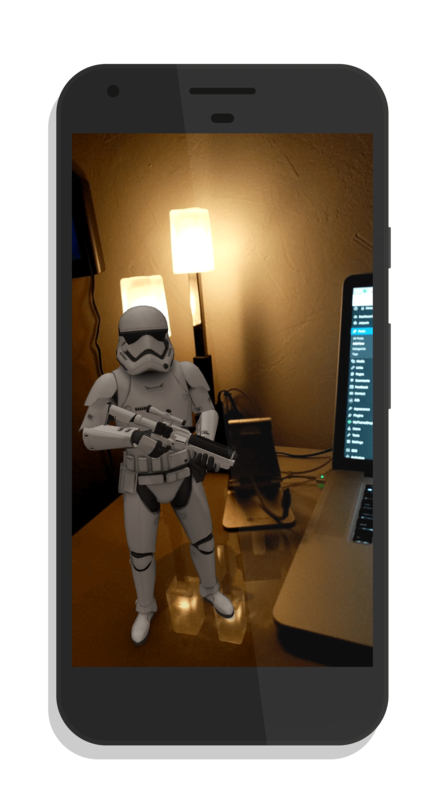 While adding a Stormtrooper to your desk is fun, the practical implications for AR are huge in science, medicine, real estate… really, it is almost endless. Mobile World Congress is next week in Barcelona and based on previous announcements, Google is going to be doing and showing quite a lot at the event.